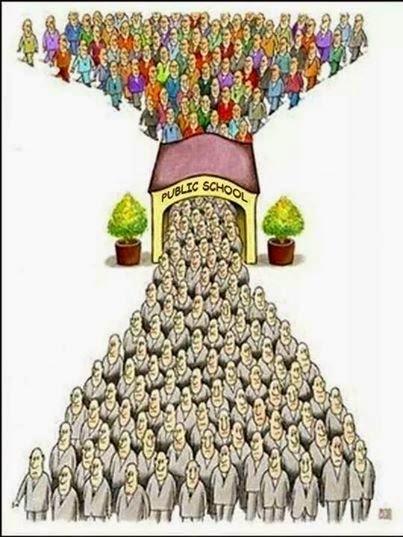 As the product of public education through my bachelor's degree and a teacher in a public higher ed, I want to resist the implications of this cartoon. I had several teachers throughout my education that gave me the motivation and drive to be creative, independent, and confident. As a teacher, I of course tear up at the end of Dead Poets' Society and envision myself as pushing back the edges of an impending wave of status quo-laced doom every semester. But I also know that my idealistic education utopia only exists because of its stark contrast with a stream of educational focus that is very much about obedience and conformity. I was brought face-to-face with that reality while reading a kindergarten readiness checklist sent home in my daughter's preschool materials recently. The list includes a mix of the practical ("manage bathroom needs"), the fine motor ("trace basic shapes"), and the verbal ("talk in complete sentences of five to six words"). It also contains some skills that are specifically aimed at self-control and behavior management ("begin to control oneself" and "listen to stories without interrupting"). All of those, even the ones aimed at behavior and control, seem completely reasonable and necessary to me. But I have to admit two of them made me bristle. "Be able to recognize authority" and "start to follow rules" have an ominous tone to them that hint at that very stream of education I find myself frequently pushing against. And it's not simple. I'm a teacher. In fact, I teach a population of students that are prone to outbursts and disruption even as adults. There are panic buttons in my classrooms (though I've luckily never had to use one). 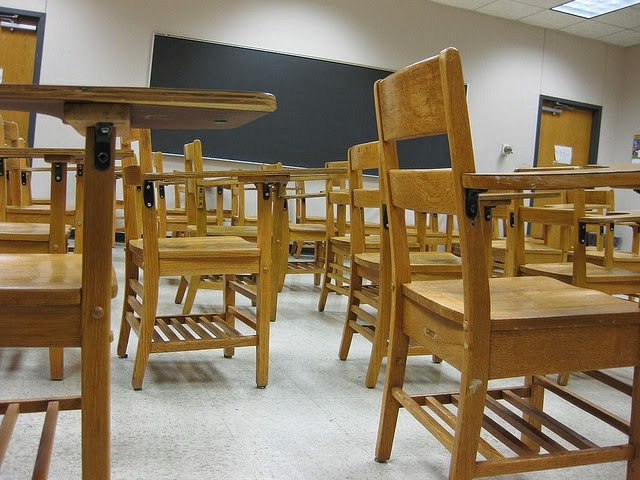 I have told students to leave my classroom for insubordination, and I have--on one occasion--contacted the school's department of safety to ensure that a student received counseling before being allowed to return. I am not against order and rules and regulation because I know that without them, no one will learn anything. I'm not calling for educational anarchy. But I also know enough about learning to know that just because things are neat and tidy doesn't mean they're working. In fact, since learning requires an element of failure and reflection, a classroom that is too neatly controlled is suspect to me. Students who feel empowered and comfortable enough to debate one another and the teacher, challenge conventions, and otherwise push boundaries are often students who are set up to make progress. I also rely heavily on my own experiences from the other side of the classroom. I was a very "good" student. I never had detention. I always turned in my work, and the one time I got my name written on the board in elementary school (for not hearing when the teacher called us to line back up after recess), I cried for two weeks. No one drilled this need for obedience into me; it just seemed like the right thing to do. But it did not always make for positive learning experiences. Just because I was sitting attentively and minding all the class rules didn't mean I was actively engaged. In fact, the teachers I learned the most from were the ones who allowed for more flexibility and non-conformity. Those lessons stuck better. As a parent, I understand the desire to include "be able to recognize authority" and "start to follow rules" on the list of readiness skills. The other day, my daughter (who is three) cried the entire twenty minute ride to the grocery store because she wanted her octopus cup. There was no reasoning with her. It didn't matter that I promised we'd get a drink as soon as we stopped. It didn't matter that we firmly told her to use her "inside voice." Nothing mattered but her sheer will to let her displeasure be known, and it was grating, exhausting, and all-around horrible. But I've written before on how I'm not sure I really want an obedient toddler. Today she fights against the injustice of nap time and discarded octopus cups, but someday that passion and energy could be directed toward fighting against injustices that seem a little more deserving: violation of human rights, for instance. I do want my daughter to be attentive and polite in her classrooms. It does matter to me that she follows directions and makes that space one in which both she and her fellow classmates can learn. But I still feel a tinge of anxiety over those two readiness measures. For me, her ability to "recognize authority" and to "start to follow rules" is much less important than her ability to recognize how her own actions and choices impact those around her. I want her to make responsible choices about her behavior based on her awareness of her place in a larger social structure, not simply because a voice on high has demanded it of her. That, though, is probably a tough thing to reflect in a checklist. What do you think? Is education stifling creative expression? Does it exist to reinforce the status quo? What about all of us teachers who see ourselves as doing just the opposite? Are we deluding ourselves? There's a difference between recognizing authority *just* *because* it's authority and recognizing authority because that authority is worthy of respect. We had a big argument over this on FB -- whether the teacher was right to punish the kid, in the name of asserting her authority. My argument is that the teacher lost any scrap of real authority she had any hope of ever having when she punished a student for being right. Other people asserted that teachers have to have total authority in the classroom, no matter what the cost -- that they can never allow their authority to be challenged. I've also had some understand that real thinking, real learning, production of work (in my case, writing) that matters is sometimes messy and fraught with emotions -- emotions that, in a 9th grader, need a safe outlet. But, yes, I do think there is a certain amount of incentive for teachers to maintain the dog-and-pony show of obedience (with or without deep learning). "There's a difference between recognizing authority *just* *because* it's authority and recognizing authority because that authority is worthy of respect." Yes! I want my child to recognize authority, but authority is something created out of interactions and respect. And it's a shifting thing. One's authority is not bestowed and then forever granted. I want her to learn that nuance from the beginning because blindly following authority is no better than following no authority at all. Ewwww. Status quo. Blindly trusting authority: when people give law enforcement a pass on everything, including murder, because they are law enforcement , and if only the suspect had followed the rules, they would not have been gunned down by the police. Does that make sense? It's disgusting. I think kids do need rules and yes should be taught to respect those around them, and yes listen to their teachers, but they should be allowed to call out those abusive authority figures and injustice, and be heard, not punished. If it's possible, British people might hate children more than Americans. Children are not allowed in saunas here or in the baths in Bath. They try to say it's partly for their safety but really, adults see it as an adult environment and are afraid of children misbehaving. We went on a trip to Germany and it felt like children were so much more accepted.